While not perhaps one of the very first questions a traveler will ask when adjusting to a new culture; one that I find myself asking within a very short time is: “What alcohol is available here?” I am by no means a beer connoisseur, I do not know the lingo, the technique, nor have I had much experience with beer. Often, I prefer wines and spirits over beer and due to this, plus my time spent in Asia (not known for their beers), my exposure to beer is pretty limited. But now that I am in Europe, I feel it is time to rectify this. In Sweden, any beverage containing over 3.5% alcohol can only be carried at a government-regulated store called, Systembolaget. So, I have taken it upon myself to do a reasonable, though by no means comprehensive, survey of the beers of Europe, as they are available in the Systembolaget. I will go country by country and rate the beers on the following Triple A rating scale. 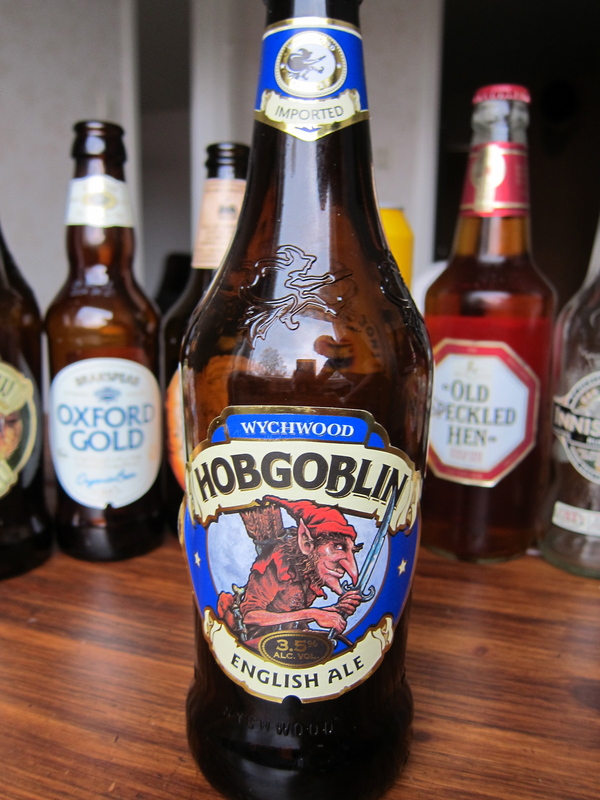 Hobgoblin: An English Ale brewed by Wychwood. (England) “Full bodied & well-balanced with a chocolate toffee malt flavor, moderate bitterness & a distinctive fruity character & ruby-red glow.” – Jeremy Moss, Head Brewer www.wychwood.com I gave this beer an AAA, good flavors without too much bitterness or overpowering malt flavor. 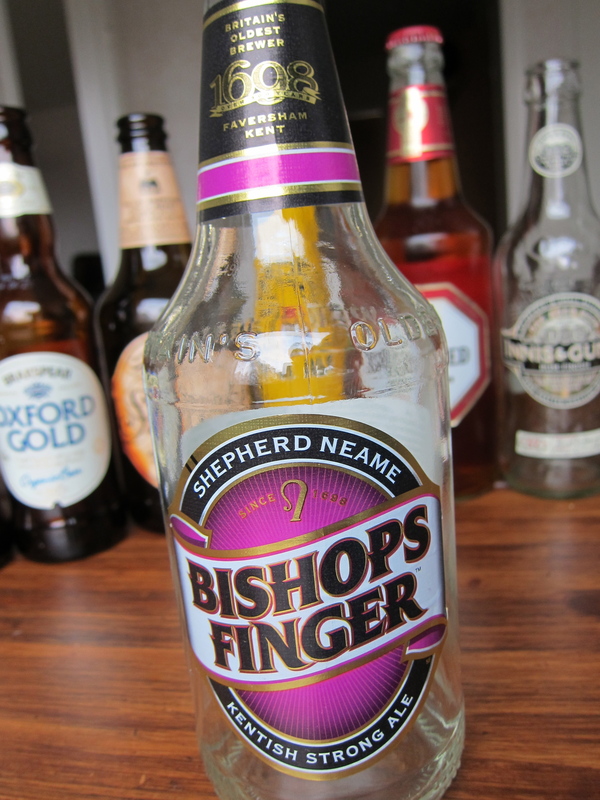 Bishops Finger: A Kentish Strong Ale by Shepherd Neame. (England) “Bishops Finger is named after an ancient Kentish signpost found on the pilgrims way pointing to Canterbury and The Shrine of Thomas A Becket. It was first brewed in 1958 to celebrate the end of austerity after the war. It was Shepherd Neame’s first strong ale after over twenty years of malt rationing.” See – Chestnut brown Smell – Roast, Toffee, Berries Taste – Rich, Fruity, Bitter www.shepherdneame.co.uk I gave this beer an AAA. At first sip, I thought it would be too bitter; but, before I knew it I had drained my ½ liter and looking for my next. 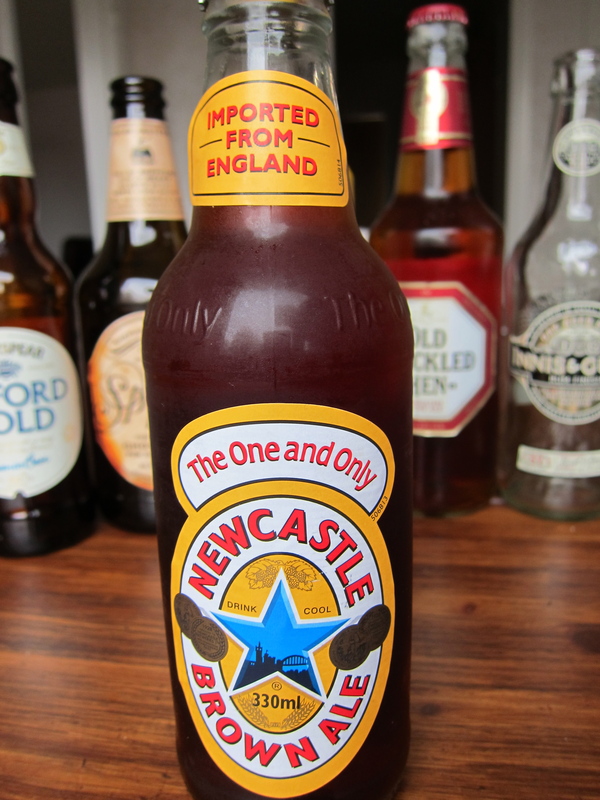 Newcastle Brown Ale: The One and Only by Heineken (England). As the bottle had no description, I pulled this from their very snazzy website: “A true One and Only, Newcastle Brown Ale features fewer hops for a less bitter taste, a blend of both light and dark malts for a unique, smooth flavor and a cool temperature for easy drinking. www.newcastlebrown.com I gave this beer an AAA. Frankly, I was a bit surprised. Though I had seen this brew in the States, I never had it nor had I ever heard much about it; but drinking it was really nice and I was quite sad that I didn’t have another to follow the first immediately. 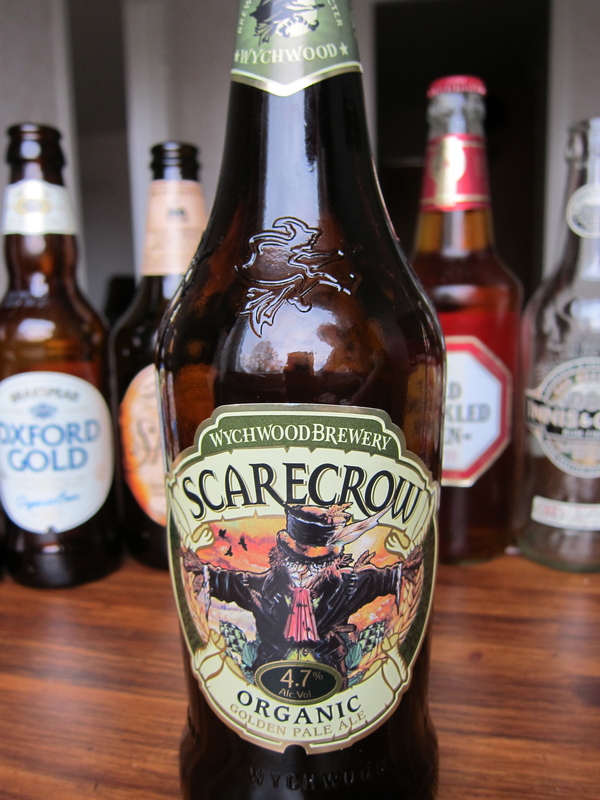 Scarecrow: An Organic Golden Pale Ale by Wychwood. (England) “Organically grown English Barley Malt & whole leaf Target Hops combine to evoke a lazy, hazy days of summer in this serenely satisfying golden harvest brew.” www.wychwood.co.uk I gave this beer an AA, a standard malt & hops focused beer. 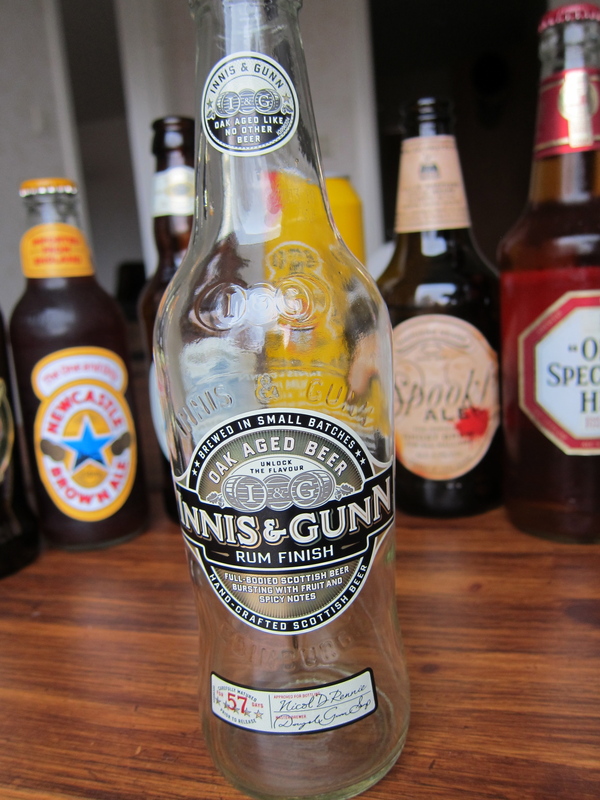 Innis & Gunn Rum Finish: Hand-Crafted Scottish Beer by Innis & Gunn. (England) “This ruby red beer is matured over the finest rum-infused American Oak heartwood resulting in a beer with a delicious warming character that is bursting with fruit and lively spices. These vibrant flavors perfectly balance the beer’s toffee-malt backbone making it an ideal accompaniment to game meals like venison or duck. It is sublime with mature cheeses served with good chutneys and relishes. www.innisandgunn.com I gave this beer an AA, a bit bitter for my taste and just not as good as the original. 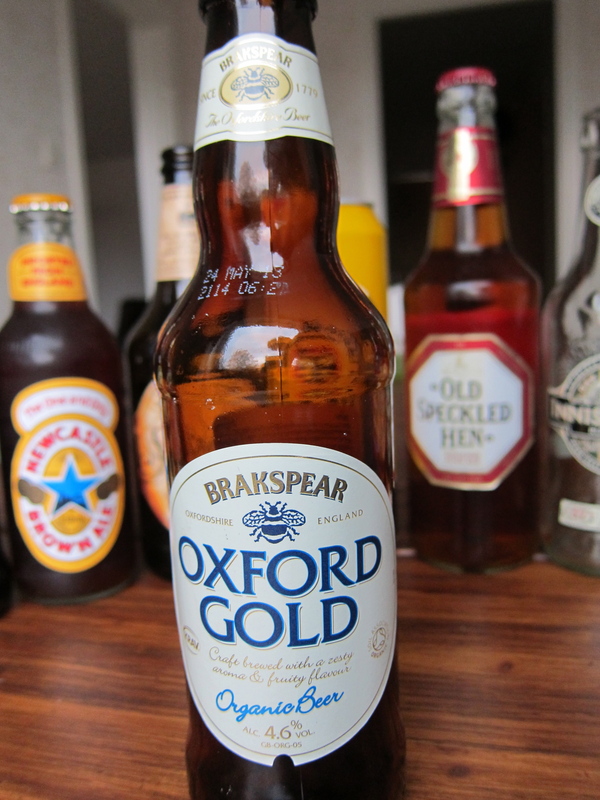 Oxford Gold: an organic beer by Brakspear (England). “Oxford Gold is craft brewed with organically grown ingredients. Over 200 years of brewing tradition has ensured Brakspear beers are renowned for what is best in British brewing.” www.brakspear-beers.co.uk I gave this beer an AA, a nice golden ale but did not possess any extra flavor to bump it up. 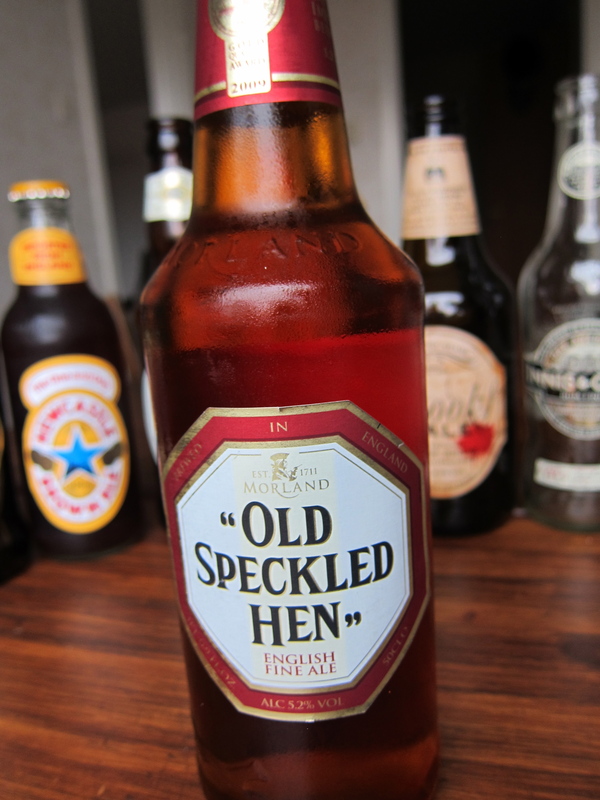 “Old Speckled Hen”: an English Fine Ale by Morland (England). “First brewed to commemorate the 50th anniversary of the MG car factory and affectionately named after an old MG car used as a factory runaround – ‘The Owld Speckled Un”. www.oldspeckledhen.co.uk I gave this beer an AA. While being a pretty good brew, I felt that it was very similar to a Bishops Finger and that I would prefer a Bishops Finger over this Old Speckled Hen. 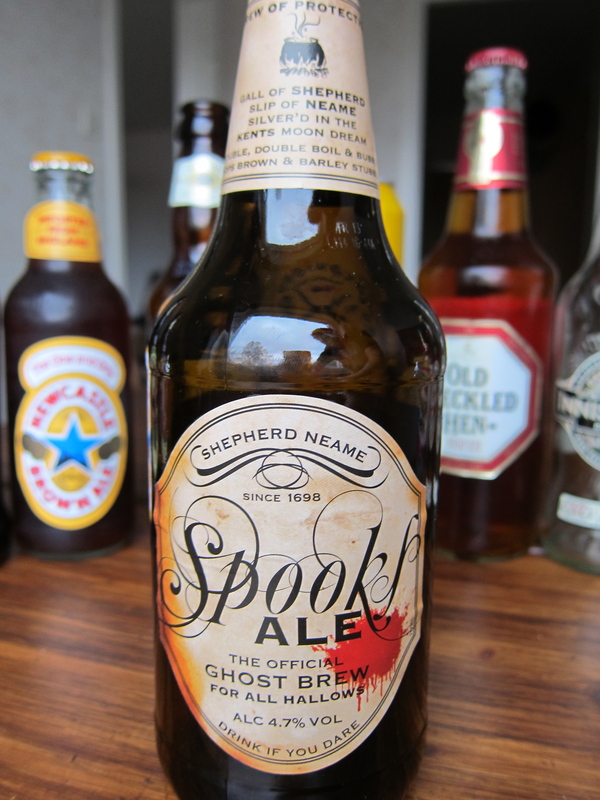 Spooks Ale: The official Ghost Brew for All Hallows by Shepherd Neame. “A classic beer of true quality, Spooks Ale is characterized by its huge biscuit malt palate, derived from three traditional roasted barley malts used in the mash, giving a glorious deep red hue. The excitingly complex malty flavours are wonderfully balanced by a huge citrusy, hoppy bitterness and aroma from a particularly fruity hop added at four stages in the brewing process. The memory of the beer will haunt you forever!” See – Dark Ruby Smell – Fruity, Citrus, Biscuity Tastse – Rich, Spicy, Roasted www.shepherdneame.co.uk I gave this beer an A, nothing really special to set it apart from most beers, it is actually a bit forgetable. Boddingtons Pub Ale: ‘Smooth and Creamy’ by Boddingtons (England) “Since 1778 when it was first brewed at the Strangeways Brewery in Manchester, Boddingtons has been renowned as a unique, pale-gold ale. 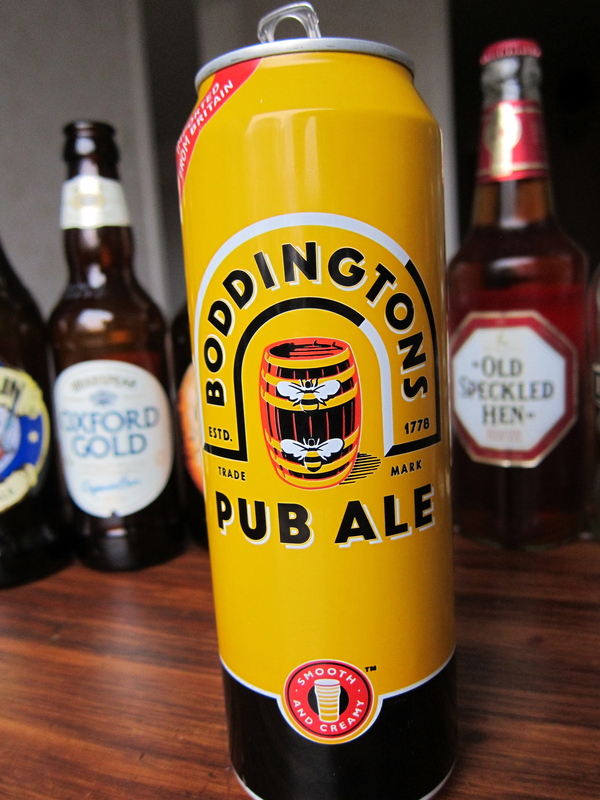 In English pubs, Boddingtons is served using the traditional hand pulled method, producing a distinctive creamy head and smooth body, with little gassiness. www.boddingtons.com I gave this beer an A, while it is smooth and creamy, it is also quite bland and watery. If you have any differing opinions, or additional beers from England that you would like to recommend, please leave a comment. Pingback: Beer – #69 – Shepherd Neame – Spitfire | Pdubyah – a life just as ordinary. 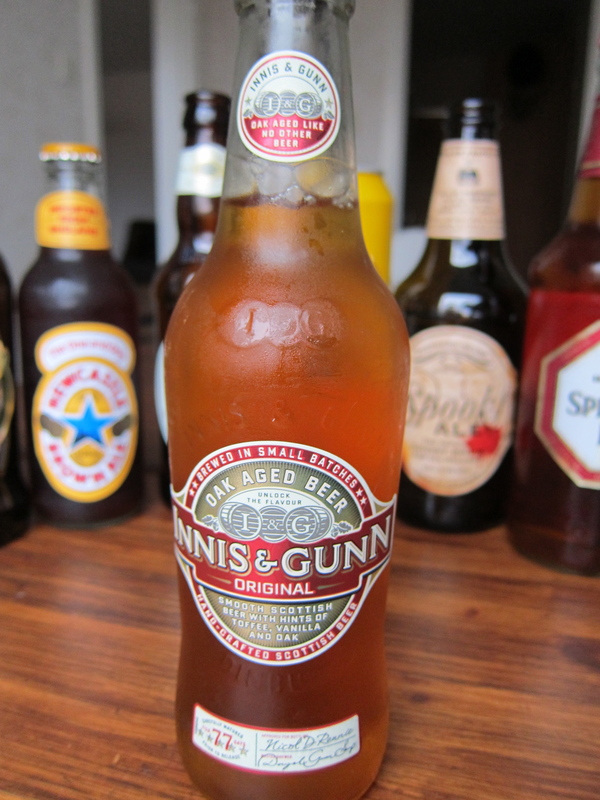 Beer, from the home of beer…. I think, or Europe, It’s been a while since I left.